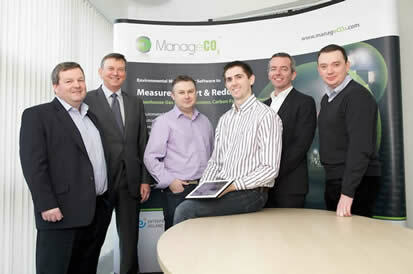 Limerick based green technology company Manage CO2 has received a significant boost with news it has raised €600,000 in venture capital funding. The investment from Enterprise Equity Venture Capital, Bloom Equity, and Enterprise Ireland, represents the first injection of outside equity into the company. Founded in 2009 by three former Dell employees Adrian Fleming, Derek Spillane and Roy Meaney, Manage CO2 offers software that helps organisations measure, report and reduce their carbon footprint. PJ Browne of EcoSecurities is also a director. Like all start-ups, the company began with a bright idea, but the development of the business was given added impetus when Dell decided to stop manufacturing in Limerick. “I originally got the idea from talking to a friend who worked for a large multinational. He was using 30 or 40 spreadsheets to measure the company’s carbon footprint, and I saw there was a better way to do this,” explains founder Adrian Fleming, a former Dell employee. When Dell announced the manufacturing closure in January 2009, Fleming saw his chance, took redundancy and began working on the business idea. Within a year, Spillane and Meaney, also former Dell employees, had joined the business. Throughout the next year, the fledgling company focused on developing the product by embarking on significant market research. “We must have rung around 60 UK and Irish multinationals, and spoke to a range of environmental and sustainability managers before we started designing the product, asking them what they wanted from a carbon reporting product,” recounts Fleming. He says a 12-month Leap enterprise programme at the Limerick Institute of Technology was a major help in making the transition from software to business, helping to “bridge some of the gaps” he had on the business side. By the end of 2010 and into 2011 the company secured its initial sales through cold-calling, securing contracts with companies such as Irish Ferries and Independent News and Media. A contract with Climate Care, one of Britain’s biggest carbon offset companies, paved the way into reselling as a route to market, a method that is forming an increasingly large part of the business. A contract with Australian company Golder, one of the world’s largest environmental consultancies, was a major win for the company, introducing it to users in a number of countries. Other clients include pharmaceutical companies in Ireland, with the company seeing significant room for expansion in this area. The software offered by Manage CO2 enables companies to quantify their carbon emissions across all their operations. The software offers an interactive dashboard which gives the customer visibility about exactly where and how much carbon they use. The user can input data in three ways – manually, through mass upload whereby existing data is uploaded, and hooking into existing enterprise resource planning systems to extract data. One of the strengths of the technology is that is it is a hosted solution, which means that clients do not have to install the software at their own premises but can log on to Manage CO2’s servers remotely. As a result the company can sell their product using teleconferencing, webinars and online demonstrations rather than having to travel to their international client base. Some 40 per cent of Manage CO2’s business comes from Britain, 30 per cent from Ireland, and 30 per cent from the rest of the world. Britain is a particularly important market for the company due to mandatory legislation in place regarding carbon emissions. Under the CRC Energy Efficiency Scheme, British companies with an electricity bill of more than half a million pounds a year across all their sites must report their emissions. This affects a wide range of companies such as supermarkets, restaurant chains and universities. While the only mandatory carbon emissions scheme operating in Ireland is the EU emissions trading scheme, which applies to a small number of large emitters, Manage CO2’s software is used by a number of Irish companies that use the product as a way of identifying savings on energy costs, or as a way of meeting green targets for their corporate social responsibility agenda.